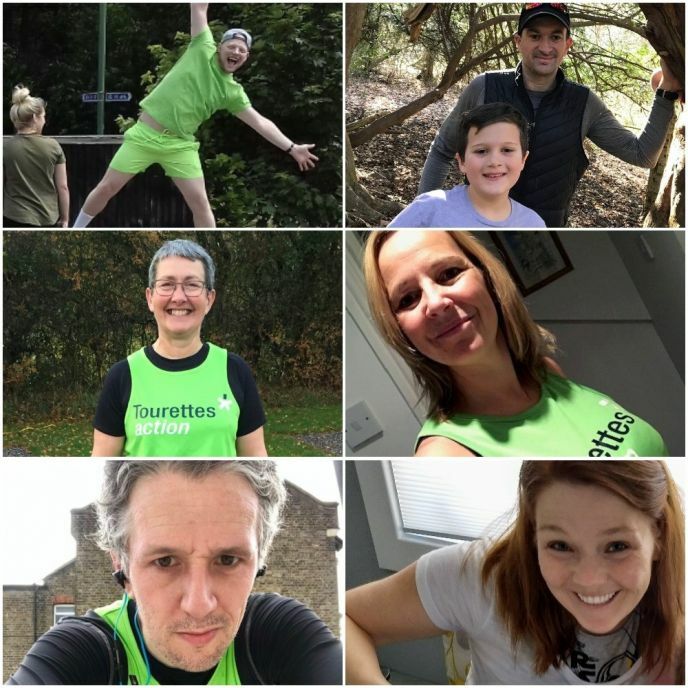 A record number of hopefuls applied for one of only 5 charity places available to Tourettes Action in the 2019 Virgin Money London Marathon. Our successful candidates are gearing up to tackle the biggest fundraising event on the planet, raise lots of money for TA and fulfil a truly amazing personal achievement. So let's find out who they are! Pictured above clockwise from top-left: Kyle Davidson, George Swan, Katy Allaway, Jen Barozie, Ben Elliott and Deb Heighes. This great charity has supported my brother since he was diagnosed nearly 20 years ago! More recently, my niece has also been diagnosed with Tourette Syndrome. I have always wanted to run the London Marathon and now I get to do it in aid of Tourettes Action UK. I'm a sports fanatic, who enjoys playing most sports to stay fit and healthy, but I also love anything competitive! Please get behind me so I can achieve my fundraising target as early as possible so that I can focus on my training. Our son Joseph was diagnosed with TS in 2017 and is learning to live with his condition. When Joseph was first diagnosed, TA helped to provide us with resources to help him, us and his classmates understand the nature of the condition and what we could do to help him. He and we have been comparatively lucky - we have managed to get wonderful support from St. Thomas' Hospital but many others struggle to get proper diagnosis and support. Tourette Syndrome is a condition that not only impacts the person itself but can seriously affect their loved ones too. I want to help fundraise for TA to help raise the profile of the condition and because, for many people, TA is the only resource that they can call on for help. TA also do a wonderful job supporting families and fostering research. My son has Tourette syndrome and although he is now stable and in a special needs school, he has had an incredibly tough couple of years, including missing a whole year of education. Had we known about Tourettes Action earlier on, I know we would not have felt so alone and lost in our journey. I want to raise the profile of the charity to hopefully prevent other families going through the hell that we went through. I'm Jen Barozie and along with my brother Chris we are attempting to run all 6 world major marathons. The races are amazing life experiences and along the way we get to raise money for some pretty great charities. This time around, I'm raising money for Tourettes Action. My family member Dr. Cathy Budman, MD dedicates her life to treating children and adults with Tourettes Syndrome. She is an international expert and incredible human being. Cathy supports my brother and I whenever we run and in return I would like to support her work. Our family cares about Tourettes: more research, support and advocacy is needed. Its more common than you may realize and society benefits from greater understanding of this disorder and of course, from greater compassion. Tourettes Action does a fantastic job in the UK that benefits the entire world. This will be Ben's 2nd London marathon but his first for Tourettes Action. Ben's family have recently connected with TA for support for his 6 year old daughter. After being introduced to the TA Befriending service, he says 'we were really relieved to feel the immediate benefit of your support'. Having realised how important this support is to families like Ben's, he decided the best way to show his appreciation is to raise awareness and some much needed money for Tourettes Action. Hi, I am Deb. I have recently been able to retire and also enjoyed a ‘significant’ birthday. My working career was basically teaching: teaching science, school senior leadership, then working in a local UK University training secondary teachers and also University lecturers. I started running regularly a few years ago when I needed to ‘get a grip!’. I was eating too much, drinking too much and I was grumpy about the state of the world and my life. It is the best decision I have ever made as it helped with all of those personal challenges and introduced me to lots of lovely people and got me outside in all weathers. It also introduced me to Tourettes Action when my running club did a run in aid of TA and I learnt about the charity and what it does. I realised then that in all my time in eduction and teacher training I had not given a second thought to the needs of those with Tourette syndrome. And I wanted to put that right. That is how I ended up applying to run the London marathon for TA and how I will be raising the profile of what TA does whilst meeting my fund raising goals.